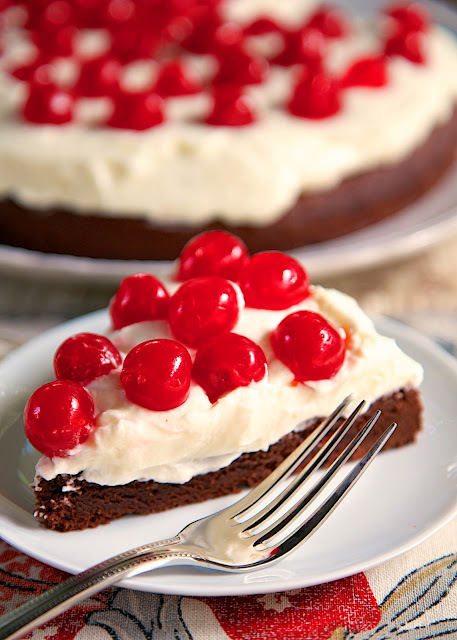 Chocolate Cherry Torte - brownie base topped with a whipped cream and mascarpone frosting. It is to-die-for! A real show stopper! Perfect for the holidays. November is here, and that means I am in full blown holiday mode! There is a radio station in town that is already playing Christmas music. I *may* be listening to it when I run errands. I can't help myself. This is my favorite time of year! This Chocolate Cherry Torte is the perfect holiday dessert. Not only is is super delicious, it is a real show stopper! Almost too pretty to eat. Almost! You definitely want to eat this dessert! The chocolate base is very brownie like. It is made with the new White Lily Enriched All Purpose Wheat Flour and Red Grape Seed Flour Blend. It is Whole Wheat Flour blended with ground Red Grape Seeds. It has great flavor and goes perfectly with chocolate. What really puts this dessert over the top is the whipped cream and mascarpone frosting. OMG! It is to-die-for. I could eat it by the spoonfuls. This torte can be made a day in advance and frosted right before serving. This is definitely going to be on our holiday table! Preheat oven to 350°F. Coat bottom of 9-inch springform pan with no-stick cooking spray. Beat butter, sugar and vanilla in large bowl with electric mixer on medium speed until blended. Beat in eggs. Stir together flour, cocoa, baking powder and salt in small bowl. Gradually add to creamed mixture, beating until well blended. Spread evenly in prepared pan. Bake 25 to 30 minutes or until cake is set in center. (Cake will not test done with toothpick.) Cool completely in pan on wire rack. Beat cream, powdered sugar and almond extract in medium bowl with electric mixer on medium-high speed until soft peaks form. Beat in mascarpone cheese until blended. Spread over cake in pan. Chill several hours. Remove sides of pan. 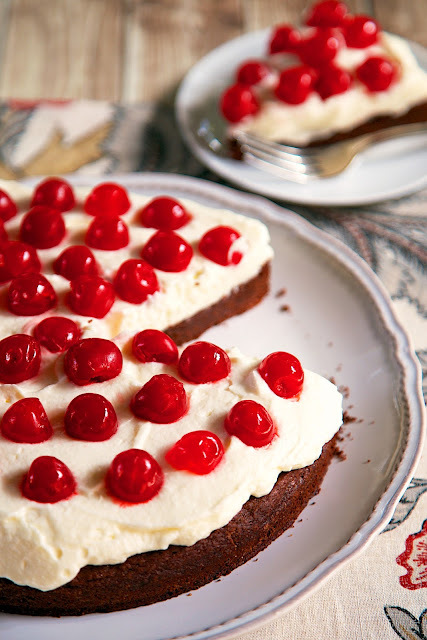 Arrange cherries over cream layer. Garnish with chocolate, if desired. Very festive dessert. Looking forward to making it! This sounds delicious! Thank you for the opportunity to try these new flours.